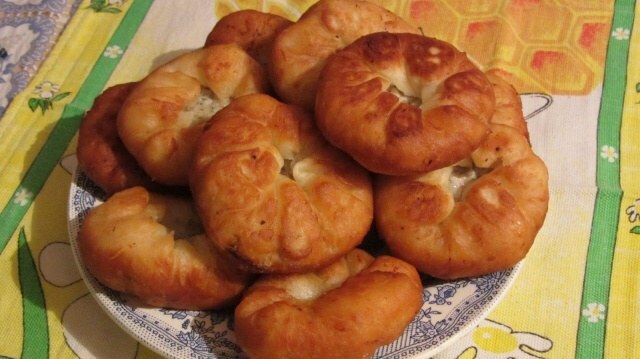 Belyashi with meat – very tasty and juicy patties, fried in vegetable oil. Make classic meat patties of the dough and for the filling, take the mixed minced beef and pork. To make the dough, you will need the following products: 2,5-3 cups wheat flour, 1 Cup milk, 1 egg,1 tablespoon of sugar without slides, 11 g of dry yeast, half a teaspoon of salt, 6 tablespoons of vegetable oil. To prepare the filling: 300 g pork 300 g of beef, 2 large onions, half a Cup of milk, ground black pepper and salt to taste. For frying meat patties need refined vegetable oil. The milk is heated to a temperature of 35-40oC. In warm milk add yeast, sugar and put in a warm place for a quarter of an hour. On the surface of the milk to form a "cap". 2 cups whole wheat flour sift through a sieve. To the flour add the prepared yeast mixture, salt, vegetable oil and beaten egg. Kneaded elastic dough, not sticky to hands. If the batter is sticky, it is gradually mixed the flour left. The finished dough grease with vegetable oil or sprinkle with flour and put in a warm place. Beef and pork free from films and cut into small pieces. Cut onion slices. The meat and onions twice passed through a meat grinder. You can also grind meat, chop onions in small cubes. Then onion salt and grind with hands until the juice. Grated onions combine with the meat. Minced salt and pepper to taste. To belyashi with meat was quite juicy, it is recommended to add stuffing in the milk. However, it is not necessary to bring the stuffing is too liquid consistency. After about an hour the dough will increase in volume almost in 2 times. It obmanut and, if necessary, kneaded, adding flour. Then the dough cut into small balls of approximately equal size. Each ball is rolled into rounded not thin flatbread. In the middle of the workpiece, spread the minced meat and the structure of the edge of the cake, leaving the center of belyashi hole. Prepared to roast the tat lightly pressed against the palm of his hand, giving it a more flat shape. Thus, the stuffing is evenly distributed inside the Patty and frying oil will need less. Put the pan on a medium heat. Oil, pour a layer about 1-go see once the oil is hot you can start cooking the meat patties with the meat. Put belyashi in the pan holes on the bottom. In this case, the juice won't leak out of the pie during further roasting. Each side belyashi fried 4-5 minutes. As necessary, pour vegetable oil. Ruddy ready belyashi lay out on paper towels to soak up excess fat.